This entry was posted in News on 18th April 2019 by Mundford Parish Council. Please find below a link to the Election of Parish Councillors. This entry was posted in News on 19th March 2019 by Mundford Parish Council. Please find below a notice from Suffolk Highways regarding works to be completed in Lakenheath. We will be carrying out major maintenance work to Witlon bridge located on the B1112, Station Road, Lakenheath. The work is planned to start on 25 March 2019 and will continue for 14 weeks. The majority of the work will be carried out Monday to Friday from 8am until 4pm each day. Noise will be kept to a minimum at all times. Traffic will be managed by a temporary single lane and two way traffic lights for the duration of the works (including weekends). A 30mph speed reduction will also be in place. The times and dates of works may change depending on the weather conditions. If they do change, we will let you know by updating the information signs on site. The closure dates and times are also subject to change. Access to all properties and businesses will be maintained for the duration of the works. Pedestrian access will not be available whilst the road closures are in place. During the periods of road closures, traffic will be diverted via a sign-indicated route. Please see the information over the page for more details of how access to your property will be affected by the works, as well as other frequently asked questions. If you have any other questions about the work, please call us on: 0345 606 6171. Once we have completed the works, it would be helpful if you could take a few moments to complete a short survey at www.suffolk.gov.uk/suffolk-highways-survey. Your answers will help us improve our service in the future. This entry was posted in News on 15th March 2019 by Mundford Parish Council. THE WEETING PARISH COUNCIL MEETING ON THURSDAY 21ST MARCH WILL START AT 6.30 PM THIS IS TO ALLOW TIME FOR ANY MEMBERS OF THE PUBLIC TO PUT FORWARD THEIR VIEWS AND COMMENTS REGARDING THE PLANNING APPLICATION THAT HAS BEEN RECEIVED FOR THE CREMATORIUM IN WEETING. This entry was posted in News on 14th March 2019 by Mundford Parish Council. 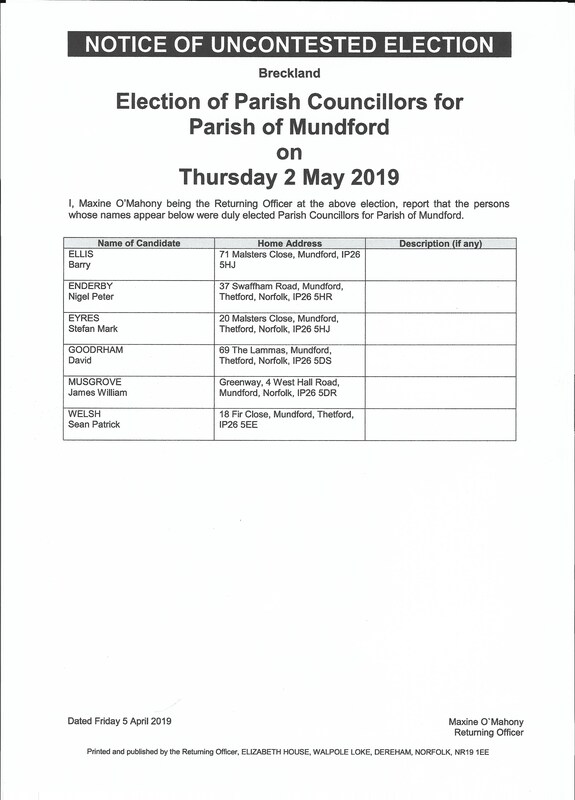 Mundford Parish Council would like to invite any resident of Mundford who really cares about their local community to stand in the local elections on Thursday 2ndMay 2019. Contact Mrs Sam King, Mundford Parish Clerk at the following email address: info@mundfordparishcouncil.co.uk or call on 01842 879152. Notice of Election goes up 18th March 2019. The deadline for Nomination Papers to be delivered in person to the Electoral Services team at Breckland Council is 4.00 pm on Wednesday 3rdApril 2019. This entry was posted in News on 1st March 2019 by Mundford Parish Council. This entry was posted in News on 21st February 2019 by Mundford Parish Council. In accordance with the provisions of Section 14(2) of the Road Traffic Regulation Act, 1984, the Norfolk County Council HEREBY GIVE NOTICE that owing to urgent surfacing works the use by vehicles of the Brandon Road from its junction with High Peppers Hill for a distance of 500 metres southwards in the PARISH OF WEETING WITH BROOMHILL will be temporarily prohibited on 24th January 2019 for the duration of the works, expected to be about 1 day within the period. If necessary the restriction could run for a maximum period of 5 days. The person dealing with enquiries at Norfolk County Council is Adam Mayo (Community and Environmental Services) Telephone 0344 800 8020. This entry was posted in News on 24th January 2019 by Mundford Parish Council. The Parish Council would like to thank all the villagers for their time and effort spent keeping gardens and hedges tidy. We do get requests from time to time asking for hedges to be trimmed back to the back of the pavement. This is to make sure there is room for Mums with pushchairs and wheelchairs to pass without having to go into the road. Thank you for assisting in this matter. This entry was posted in News on 18th January 2019 by Mundford Parish Council. The Parish Council have been chasing Highways to get the repairs to the white fence barriers on both sides of the Swaffham Road repaired following the three recent accidents. The Parish Council have also applied for a grant to extend the pavement on the village side of the Swaffham Road to a more suitable crossing point some 45 metres towards Swaffham. Highways have now installed ‘Pedestrian Crossing’ warning road signs either side of the existing crossing point by the Lynford Road turning following the meeting with Elizabeth Truss MP our local MP. The signs will be relocated when the footpath is hopefully extended as noted above. The Parish Council look forward to seeing members of the village at our Annual Parish Meeting to be held in the Cricket Club on 4th April 2019 at 7:10pm. You can meet the Council and have your say on whatever village matters you wish.